After closing three games in three days, Edwin Díaz was supposed to have Sunday off. It didn’t look like the Mariners would need him anyway, as they trailed the Astros heading to the ninth. 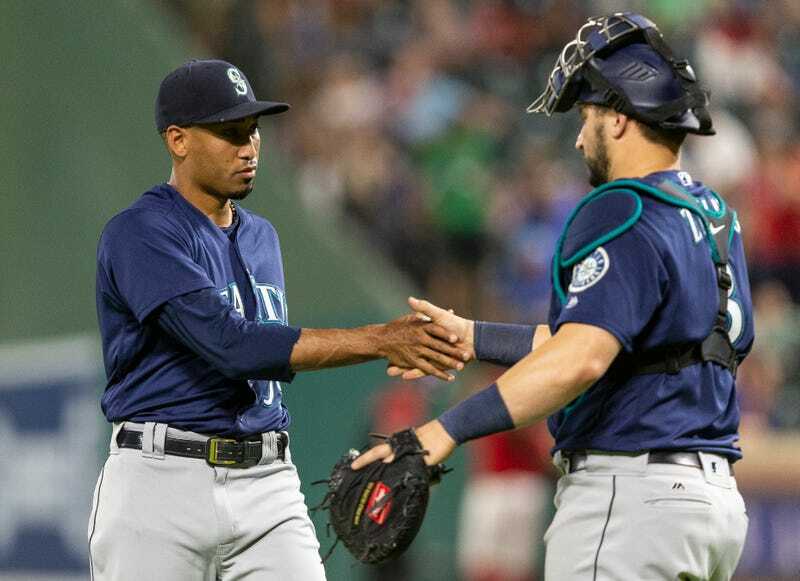 But Ryon Healy homered to tie the game, and then Mitch Haniger doubled in the go-ahead run in the 10th, and Díaz told his bullpen coach to pick up the phone and tell manager Scott Servais he wanted to go four-for-four. “I got a welcomed call from our closer. He said, ‘If we got the lead, I’m in the game.’ Sometimes you’ve got to do that. 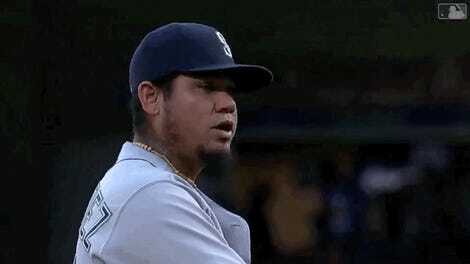 That’s kind of how Eddie’s wired and how this team is wired,” Mariners manager Scott Servais said after the game. Díaz became the first pitcher since Joe Nathan in 2004 to record four saves in a four-game series, and just the fifth pitcher ever to do it. Four saves in four days also does wonders for a closer’s pace, especially if he was already racking up an all-star season like Díaz’s. He’s now on pace to save 63 games in 2018, which would be an MLB record, surpassing Francisco Rodriguez’s 62 saves in 2008. That comparison probably says more about the evolution of relief pitchers and the current strikeout era of baseball than it does about anything else. Just seven times has a pitcher thrown at least 60 innings with a K/9 rate over 15 (Díaz will join them with one more IP), and all seven have occurred since 2010. Not that Díaz isn’t currently about as hot as a closer as ever been. Díaz, 2012 a third-round draft pick who was only converted to a reliever in 2016, the year he made the big leagues, has now converted 27 straight saves, and has an ERA of 0.39 in games he’s saved. That last stat is important, because he’s had little room to work with: 24 of his 46 saves have come in one-run games. Could Díaz be in line for Cy Young, which only Dennis Eckersley in 1992 and Eric Gagne in 2003 have ever won as closers? Probably not, if Zach Britton, who in 2016 recorded 47 saves with an ERA of 0.54(!) and an ERA+ of 803(!!!) couldn’t do better than fourth in the voting. When every closer’s throwing 100 and even the worst are striking out a batter an inning, it just might not be possible for one to win anymore. But if Díaz keeps up his numbers, if he surpasses K-Rod, and if the Mariners sneak into the playoffs, it’d be hard to argue Díaz wasn’t the difference or that any other pitchers were more valuable to their teams. Oh, and look at this: With the four-game sweep of the Astros, the Mariners are now just four games back in the division and 1.5 measly games behind the Athletics for the second wild card. And Seattle starts a three-game series in Oakland tonight. And Robinson Cano returns from his 80-game suspension on Tuesday, though he would not be allowed to play in the postseason. The Mariners are right in this thing, and Díaz is going to get plenty more chances to close things out.